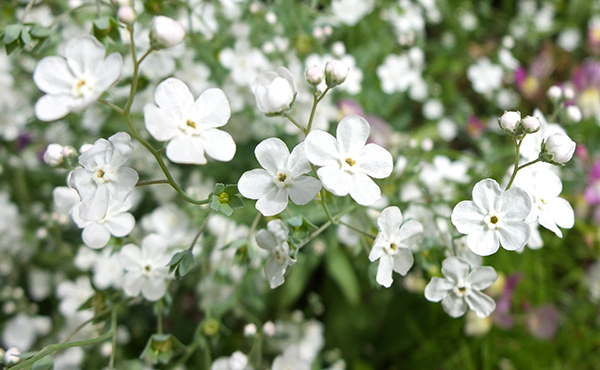 I sow my own seedlings, and plant out clumps close together, to get the full effect of the fluffy white flowers. They're individually tiny, like forget-me-nots, and altogether charming, but must be mass planted. Otherwise they'd get lost visually. In my garden Omphalodes starts flowering in late spring (or early summer) and lasts for weeks and weeks. It's so easy in the grand scheme of garden things to dismiss flowering annuals. They're cute while they're there, but rather inconsequential overall. No, no, no! The sweetest, tiniest flowers can be the biggest treasures in a garden. Omphalodes linifolia is one of these. I'd suggest pricking out six to eight seedlings into one container of potting mix, and then having three such to plant as close together as possible. And don't worry if the flowers fall over in the rain. They still look gorgeous!